The SproutMaster offers excellent drainage, and is great for growing vertical Leafy Sprouts. The SproutMaster is versatile - it can sprout virtually any seed. It is even able to grow Grass, Greens and Micro-Greens - with proper care, and perhaps a growing medium. We sell two configurations 1) Three trays that measure 5x6 inches each. 2) A Single tray that measures 8x10 inches (the one on this page). All SproutMaster trays are 2 inches deep. 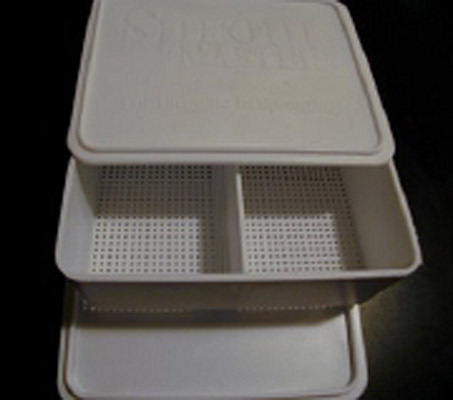 This SproutMaster is the single 8x10 inch Tray. It comes with 1 Trays, 1 Dividers, and 2 Lids/Bases. If you purchase multiple 8x10 trays, you'll end up with more of the Lids/Bases then you'll use on regularly, but extras can be a good thing.... If you would like the Three Tray version, click here: SproutMaster Triple 5x6. I have used the 8x10 sprouter and really like it, but I'm looking for the triple tray set and can't find it in the sproutpeople.org website. I bought this and the Easy Sprouter. I prefer this method. There is more room for the seeds to be spread out, so they aren't so piled on top of each other. While I prefer the easy sprouter for most of my other sprouts...I have found a way to get long, fat, rootless mung spouts after much trial and error. I now use the SproutMaster for mung beans and am finally happy with results. How I do it is I put down a layer of paper towel or cheescloth OR recently I am trying plastic screening cut to bottom of sproutmaster. Put soaked mungs in. Cover with layer of paper toweling then a wet folded kitchen towel on top for the weight. I then put the bottom and filled Sproutmaster inside a stainless steel steam table type pan about 6 inches deep, then place pan's lid on leaving the sproutmaster lid off. Rinse 2 times a day on day 1 and 2....rinse and soak for 30 mins or more, then place back into stainless pan for another day. Soak day 4, drain then put back into stainless pan...and about this time the sprouts are pushing up above the Spoutmaster...which is good cause the stainless pan keeps it very dark...I harvest when the white stem of the sprout is 5-6 inches long. I pull mass out using the paper towel or screen which holds the branching roots. I "shave" the roots off releasing the spouts from the towel or screen. This takes some practice but it allows you to grow long sprouts and eliminate the tough stringy roots. The sprouts are extremely straight done with way. IF I was the Sproutmaster folks I would change design for folks needing long mung sprouts by making it several inches deeper...AND a removable/flexible screen that one can pull mass of sprouts out and cut off the ends. Bought this as a set of 3. These are just great! I put them in the empty dishwasher and they grow and drain in there. No mess! Of course they come out for dish washing...... ;-). Very happy with this larger size.